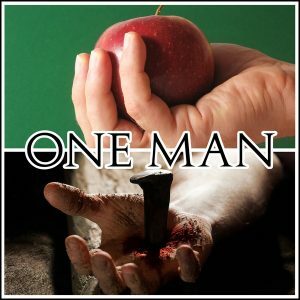 In Romans 5:12, Paul writes that “through one man sin entered the world, and death through sin, and thus death spread to all men, because all sinned.” Almost everybody thinks that Paul is referring to the event in Genesis 3 when Adam and Eve ate from the Tree of the Knowledge of Good and Evil. But is this what Paul has in mind? Let us consider the contexts of Genesis 3 and Romans 5 to see what Paul is thinking. And while we are doing that, we will also seek to define the word “death” as it is used in Scripture. Questions about death have plagued humanity since the very beginning. Where did death come from? How can we escape death? What is death? What happens after death? Is there a way to return from death? The Bible answers many of these questions, and the foundation for these answers is laid in Genesis 2–7. If we fail to understand these opening chapters, this failure has ramifications for how we understand the rest of the Bible as well. For example, vast segments of Christianity believe that death is a curse from God which came as a result of human sinful rebellion in the Garden of Eden. Many believe that because Adam and Eve ate fruit from the tree of the knowledge of good and evil, God cursed them with death, and all humanity as well. This way of thinking then gets carried over into how we understand other texts related to the gospel, and it also colors our view of God and death. But a careful study of what Genesis 2–7 teaches about death and dying leads us in a very different direction. Now, it is true that physical death came upon humans as a result of eating the forbidden fruit. But it is not true that God sent death upon humans or cursed humans with death. Many people do not realize this, but death was built in to creation, as part of creation. If that’s a challenging idea for you, go and listen to Episode 9 of the One Verse Podcast, where I teach about death and creation from Genesis 1:11-12. So death was inherent within God’s good creation, but this does not mean that God wanted humans to die. This is why God gave humans the Tree of Life. Eating from this tree would keep death from coming upon humans. When Adam and Eve ate fruit from the forbidden tree, death did come upon humans, but not because God cursed humans with death. Instead, death came upon humans because humans could not longer eat from the Tree of Life. But is this not a curse after all? Is it not God’s “fault” that humans die? No. While, it is true that God is the one responsible for keeping humans from eating from the tree of life, this is not a curse; it is a blessing. Despite the way most people feel about it, death is actually a blessing from God. The real curse would be to live forever in a sinful body. When Adam and Eve ate from the tree of the knowledge of good and evil, they permanently damaged their relationship with each other, with creation, with God, and even within themselves (This is what is seen and described in Genesis 3:7-21). The only way for God to repair these connections is by allowing our bodies to die so that He could give us new, glorious bodies that accomplished everything He planned and intended for us. In other words, once our flesh was damaged, the only way to repair it is through death. Death, therefore, is not a curse, but a cure. Genesis 5 shows that everyone experienced this kind of death as time and time again we are met with the phrase, “… and he died” (Genesis 5:5, 8, 11, 14, 17, 20, 27, 31). Yet this type of death is not the only type of death mentioned in Genesis 1–7, nor is it the type of death that Scripture as a whole is most concerned with. And this is not the type of death Paul has in mind in Romans 5:12-21. 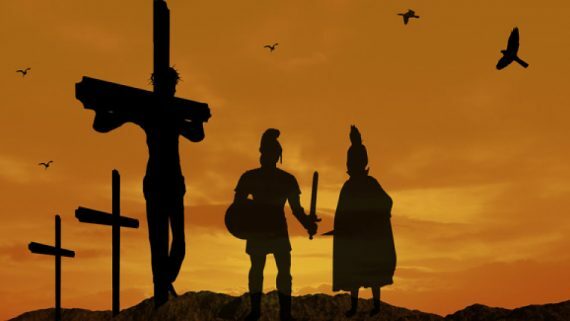 Natural death is natural, and while God did not want or intend for us to die natural deaths, it is not primarily this type of death that Jesus came to rescue and deliver us from. The first real death in the Bible is encountered in Genesis 4, and it is this death that is most concerning to God, and which Scripture everywhere warns us against. 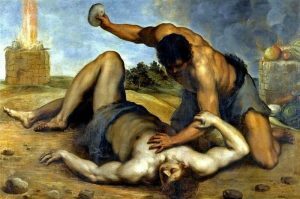 The first death in the Bible is when Cain murders his brother Abel as a result of jealous rivalry (Genesis 4:8). Many Christians believe that the first death in the Bible occurs when God sacrificed a sheep in Genesis 3:21 or when Abel made a similar sacrifice in Genesis 4:4. But a careful study of these texts reveals that no animal blood was shed. There is no animal sacrifice in Genesis 3:21 or Genesis 4:4. I have podcast episodes on these verses as well. No sacrifice in Genesis 3:21 and no sacrifice in Genesis 4:4-5. So the first death of any kind in the Bible is when Cain murders his brother in Genesis 4:8. The significance of this cannot be overstated. Since the first death is between brothers, it reveals that all violence between humans is violence between family members. When we stop to think about it, all of us are related, which means that any violence against anyone else is violence against a member of our own family. But beyond this, the source of the violent murder is Cain’s desire to have what Abel has, and the rivalry he engages in to obtain it (cf. Genesis 4:5-7). Furthermore, Cain then goes off to found a city (Genesis 4:17), which shows that murder and violence is at the foundation of all human civilization. But it is not just the murder of one against another that concerns God. God is concerned with the human tendency to escalate violence through retaliation and revenge. This is why God puts a mark on Cain (Genesis 4:15). God knows that the death of one tends to lead quickly to the death of many, and He wants to stop the process from beginning with Cain. This truth is further seen when Lamech kills a young man for hurting him (Genesis 4:23). Lamech goes on to say that if Cain would be avenged sevenfold, then he should be avenged seventy sevenfold (Gen 4:26). As all humans who engage in violence against others, Lamech feels completely justified in his own actions, and believes that any retaliation against him would be completely unjustified. But note how the sevenfold retaliation has already exponentially increased to seventy sevenfold. In Genesis 6 we see that this seventy sevenfold vengeance has overtaken the whole earth so that now, everyone is only evil all the time and violence has covered the whole earth (Genesis 6:5, 11). The one thing that God did not want to happen has happened. In Genesis 6 all humans are engaged in violence against all other humans. The earth is suffering from an all-consuming contagion of violence. So the overall truth about death in Genesis 2–7 is that there are two main types of death. One of the physical death which comes upon all people as a result of being blocked from the tree of life. This death is not a curse, but a blessing, as it is the necessary doorway to the resurrection and the glorified bodies that we have for eternity. The second form of death, however, is the main concern of God, not only in Genesis 2–7, but also in the rest of Scripture. This is the death that comes as a result of violence, and which is closely associated with sin. The death that plagues humanity and which Jesus can to rescue and deliver us from is not the primarily the death of humans dying from old age, but the death of humans killing other humans. Sin has consequences both to ourselves and others. Yes, we die physically from old age because we have been separated from the tree of life, but we also die (as do others) as a result of the consequences of sinful violence. This brings us then to what Paul is teaching in Romans 5. Therefore, just as through one man sin entered the world, and death through sin, and thus death spread to all men, because all sinned. … Nevertheless death reigned from Adam to Moses, even over those who had not sinned according to the likeness of the transgression of Adam, who is a type of Him who was to come (Rom 5:12, 14). Paul argues in Romans 5:12-21 that sin and death are not linked to the law. Both existed prior to the Mosaic Law (Romans 5:13-14), and the law serves to reveal and exacerbate the human problem of sin (Romans 5:20). Paul goes on to contrast this with the righteousness that is in Jesus Christ (Romans 5:16-18). 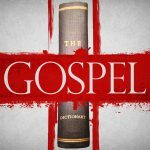 Therefore, as with many other words in this dictionary, the concept of death in Romans in closely connected with other key words that must also be understood in order to grasp Paul’s overall argument. 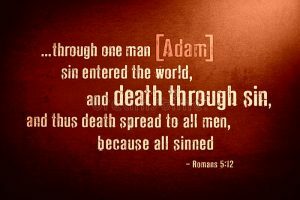 For the purposes of this entry, it is only necessary to point out that Paul writes how death came as a result of sin, and sin entered the world through one man, Adam (Romans 5:12). The order of events is that Adam introduced sin into the world, and sin brought death. Many who read Romans 5:12 believe that the sin Paul is referring to is the act of eating fruit from the tree of the knowledge of good and evil, which resulted in Adam and Eve getting kicked out of the Garden of Eden so that they later died of old age. 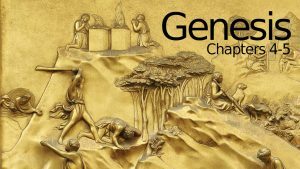 But when we go back and carefully examine the order of events the terminology used in Genesis 3–4 as we have done above, we see a different truth emerge. Yes, through Adam’s disobedience, sin was introduced into the world. But in Genesis, sin is not mentioned until Genesis 4:7, where it is connected with Cain’s desire to engage in rivalry and revenge against Abel. Adam and Eve had previously engaged in some of this rivalry when they started blaming each other, blaming God, and blaming the serpent for why they ate the fruit (Genesis 3:11-13), but the overall picture of what sin is and how it leads to death is not described until Genesis 4 where sin is first mentioned and the first death occurs. Yes, Adam introduced both sin and death to the world in Genesis 3, but both are not fully revealed until Genesis 4. 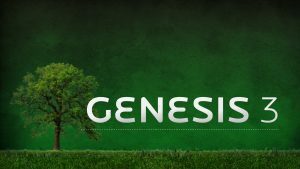 So when Paul writes in Romans 5:12-21 that sin entered the world through one man, and death through sin, we should not be thinking about Genesis 3, but about Genesis 4. The death that is most concerning to Paul is the death that comes as a result of violence. When Paul goes on in Romans 5:12-21 to write about how death reigned from Adam to Moses, even over those who had not sinned, we should be thinking about Genesis 5–7, where while some people died from old age, most of the people in these chapters died as a result of violence. None of this is how God intended or desired for humans to interact with each other. When God created humanity, He planned for us to live and work together in peace and harmony, as partners in the task of multiplying on the face of the earth, taking care of the plants and animals, and expanding the borders of the Garden to cover the whole earth (cf. Genesis 1:26-28). This was the righteous life that God wanted for us. But instead, we chose the sin of blame, accusation, finger-pointing, rivalry, and scapegoating, which leads to death, the violent death of brother murdering brother. But Jesus came to lead us back into the righteous life that God originally desired. Paul goes on to explain how this works in Romans 6-8. The transition from death unto life in the book of Romans is a transition from the sins of rivalry, scapegoating, and violence based on the law (Romans 1–3), to the reception of eternal life and the principles of the righteous life as revealed in Jesus (Romans 4–5). These truths then lead us into freedom from sin and the law (Romans 6–7), so that we no longer have to live in condemnation from God or from one another (Romans 8). Paul concretely applies all these truths in Romans 9–15. As can be seen, a proper understanding of what the Bible teaches about death helps make sense of Paul’s argument in Romans, and especially what he is teaching in Romans 5:12. While receiving eternal life is part of Paul’s message in Romans, it is only a small part. In Romans 5:12-21, Paul is more concerned with how we live our lives in Jesus Christ free from slavery to sin and the power of death. So what does the Gospel teach about Death? Yes, it is true … the gospel teaches that while humans die from sickness and old age, these things will be done away with in the future. But this truth about death is not the primary teaching in the Gospel about death. The Bible is not just concerned about future death, but present death. The gospel contains truths about death for this life here and now, and how to avoid it. The Bible says that the big problem of death is not that we will eventually die from old age or disease, but that we engage in the practices of death every day when we accuse, slander, and blame our fellow human beings. We engage in the practices of death when we approve of scapegoating, condemning, and killing other human beings. 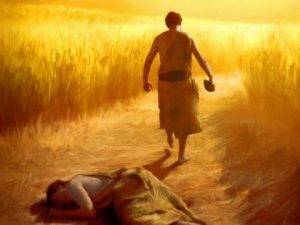 The first death in the Bible is when Cain murdered his brother Abel, and when we call for the death of other human beings today, we are following in the way of Cain. Jesus came and died to reveal this truth to us, and to call us to stop it. Rather than seek revenge and retaliation, we are to love and forgive. This is the way of Jesus and this is the call of the gospel. The gospel reveals how we participate in the killing of our brothers and sisters, and calls us to abandon these practices and follow Jesus in the way of love. This is what Paul is talking about in Romans 5 as well. The main concern of Scripture regarding death is the death that comes from scapegoating violence. This is the foundational sin of the world, and is the type of death Jesus subjected Himself to so that He might reveal to us how we humans are enslaved to death and show us a different way to live. We gain deliverance from this type of death by choosing to follow Jesus in the way of love and forgiveness, rather than in the worldly way of rivalry, accusation, and blame. Yes, spiritual death is also part of what happened in the fall. I’ve wanted to ask what you think of the works of Rene Girard (specifically, “I See Satan Fall Like Lightning” , chapter 7). Thanks for making my question relevant with your post. You both offer deep insights into the Genesis account that resonate strongly with several thousand years of history. Are there areas where you disagree with Girard in this context? If there wasn’t an animal sacrifice to cover the first sin that man recognized in himself, where did God get the skins to clothe Adam and Eves nakedness?